Today I'm sharing another beautiful creation by our March Guest Designer, Wanda Guess! 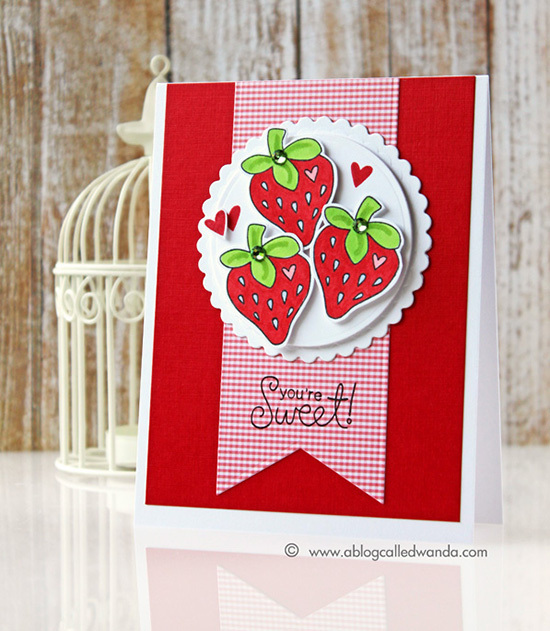 I just love the beautiful trio of strawberries on this card using stamps from our Sweet Summer stamp set! They look so yummy - and the addition of a little bling at their stems is such a cute idea! I also love the coordinating gingham checkered paper she used! This is such a fun card for spring .... Now I'm craving some strawberry shortcake!! LOL! Thanks so much to Wanda for the fun inspiration today! Make sure you head over to Wanda's Blog, A Blog Called Wanda and to see more about this card and enjoy here amazing work! Such a lovely summery card!! Those strawberry's are delightful!